Peter Brook is best known for his work in theatre, but his 1963 screen adaptation of William Golding’s English Lit classic is no quaint repertory effort. Made relatively cheaply (the opening plane crash is literally a photograph of a plane spinning around) with non-professionals in the roles of the children, it’s a remarkably raw and brutal telling of a fable which may be as relevant now as ever before. In case you’ve been living under a rock, this wartime story concerns a group of evacuating public schoolboys who are stranded on a remote island after their plane crashes. At first it’s all fun and frolics as the kids look forward to their freedom. They nominate a leader, Ralph (James Aubrey). Alpha male Jack (Tom Chapin) isn’t happy about this, and he takes his frustration out on Ralph’s bumbling friend, Piggy (Hugh Edwards). As the rift between Ralph and Jack intensifies, rumours of a “Beast” begin to circulate. Jack is convinced that the children need to focus on hunter-gathering in order to survive. However, Ralph remains steadfast in his belief in civility and order. The storm clouds are gathering, and in the absence of adults tragedy looms. Brook makes maximum use of his Puerto Rico location to produce a beautifully shot picture which is sweepingly cinematic at times. Whether it’s the sight of Jack’s lonely walk down the beach toward a new destiny, or Simon’s (Tom Gaman) tiny blonde head emerging from the swarming foliage, the kids are forever dwarfed by their alien new home. Brook also captures the emotional intensity of the situation through close-ups of Jack’s boys “going native”, transfixed and rabid; and in the dwindling hope etched on the faces of Ralph and Piggy. The sound design also deserves special mention. From the chatter of insects to the lapping of the sea, at some point the environmental soundscape becomes entwined with the sounds of the children – their yelling, their chanting and their screams. It’s like they are becoming one with the island; as if the place has consumed them. The rise of Jack’s tribe is inextricably linked to the notion of the Beast. The Beast begins as a tall tale about a serpent. Then it has claws. And then it transforms into something conceptual: a god-like creature to be respected, and to whom sacrifices must be made. In short, the Beast is anything Jack wants it to be. The film captures the way fear can be harnessed as a means of dictatorial order over an in-group – an idea which resonates only too chillingly today. “We’re not savages,” one character exclaims – “we’re English!” Of course we are all, deep down, capable of the savagery of our ancestors. Jack would argue that brutal circumstances demand savagery; whereas Ralph’s approach is that regression is not necessary when a group has the social tools to rise above their base nature. Alas, the voice of might speaks loudest in desperate times. There are key deaths in the movie, and these are deftly handled. A bulk of the praise must go to the editing, which Brook did himself in collaboration with Gerald Feil and Jean-Claude Lubtchanksy. They manage to portray the brutality of the violence by using clever cuts to trick our minds into thinking we’ve seen more than we really have. These peak dramatic moments have real impact. Given the amateur nature of the performers, it’s no surprise that some of the acting is a bit ropey by today’s standards. Edwards, as Piggy, is particularly wooden – although the stilted delivery does provide a very amusing scene where he “entertains” the young ones by explaining the etymology of his hometown of Camberley. Thankfully, Aubrey and Chapin, as Ralph and Jack, are strong players. Ralph’s journey – from leader to disillusioned outcast – is movingly portrayed, and the final close-up on his haunted face is a heartbreaker. Actually, the whole of the last act is a corker, thrillingly staged and utterly kinetic in the edit. By this point, as the smoke swirls, we realise that the story of the tribes is the fate of the war-torn Earth in microcosm. Golding’s crushingly ironic ending is intact, in all its pristine, white-uniformed glory. Brook’s film is a devastating, cautionary tale about isolationism. It’s well-made and efficient, hits the main beats of the novel, and pulls no punches. Though occasionally dated in its execution, it remains the best screen version of Golding’s timeless novel – and Criterion’s 4K restoration is the best way to watch. A treasure island of extras awaits on the disc. There are two commentaries – one with Brook, Feil, producer Lewis Allen and DP Tom Hollyman; and the second is a 1977 reading of the novel by Goldman himself, which can be overlaid on the movie. Golding also features in an included episode of the South Bank Show from 1980. There are interviews with Brook and Feil, and an excerpt from a 1975 documentary by the latter focusing on Brook’s theatre direction. We get a deleted scene featuring the characters Ralph and Jack. And along with regular behind the scenes footage, there’s a unique opportunity to see some of the 8mm footage shot by the child actors on the set. Finally, there’s the theatrical trailer. 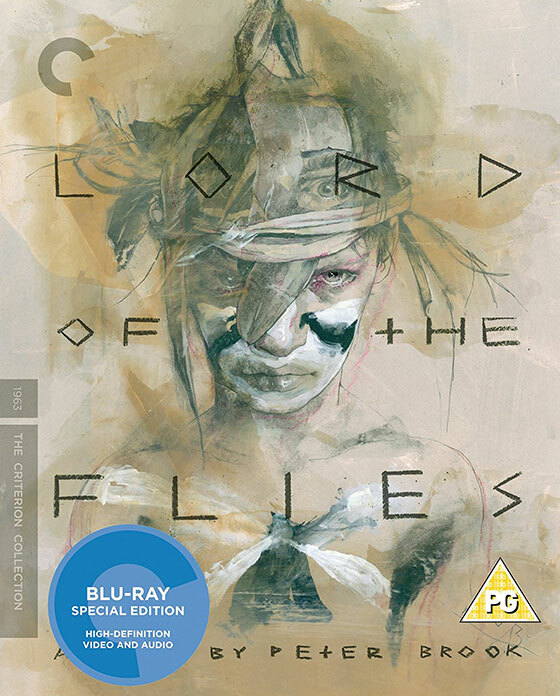 Lord of the Flies is out on Blu-ray now from Criterion.